We all know that green tea is healthy. However, most of us have only unearthed a fraction of the green teas produced around the world. 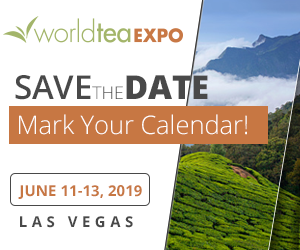 If we were to drink a different green tea variety every day for the next five years, we would not even come close to tasting all of the green teas produced by China, let alone the other tea producing regions around the world. The magic of tea blending is experimentation. Join me as we try blending together a few green teas from the vast world of green tea flavors and come up with a new elevated flavor for our daily green tea ritual. 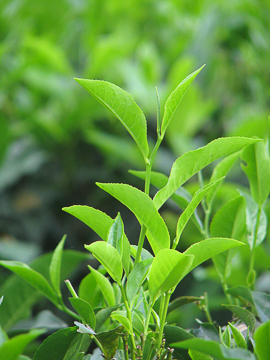 Along our path of discovery, we’ll touch on individual green tea flavor profiles. We want to elevate the taste in our tea cup by blending two green teas together for an exciting new tea tasting experience. Our goal is to open up the nuances of authentic tea blending for that daily cup of tea to bring a smile to our face. First off, why are there so many varieties of green tea? Over the past 5,000 years of tea production in China, variations were developed in remote regions around the countryside. Most of these amazing teas are still produced today. Spring produced Bi Luo Chun—with its tightly wrapped, “green snail” leaves and fruity, slightly floral notes—is one of those teas where I smile with each delightful sip. 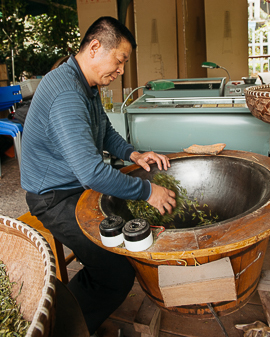 A Chinese tea master making pan-fired Longjing (Dragon Well). Photo by Arris Han. 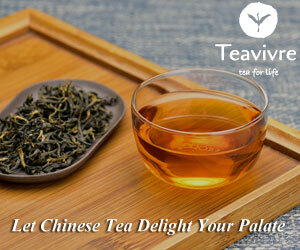 Green tea flavors also vary on the method of heat applied to the fresh, withered tea leaves. The heat on the front end of production is what fixes the flavor as green tea. Black teas are dried after processing without heat added in their production. Green tea needs to be heated first to keep the enzymes from oxidizing and making the transformation to an oolong or black tea. There are three methods of heat to stop the enzyme process in green tea: hot air, steam or pan firing. Each one of these methods provides the tea’s flavor foundation with the continued tea production method adding the delicate flavor nuances. 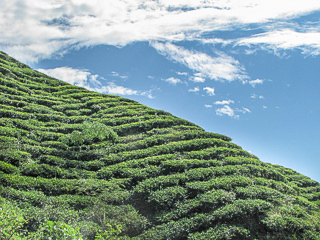 The elevation a tea is grown at and the local terroir also add to the flavor combination. OK, so what does all of this technical talk mean? A panned fired green tea will have more of a toasty, nutty foundation while a steamed green tea will have fresher, vegetive notes. One of my favorite green teas is an early spring, air-fired Chinese Mao Feng which has a light, vegetive and slightly buttery note. The most popular steamed green tea is a Japanese Sencha. The region where the tea was grown, the time of year produced and the exacting production method by the tea factory will determine the flavor profile of any particular Sencha. Even the Sencha produced from the same field will produce a slightly different flavor for you the next year based on growing conditions and the weather on the day of production. Pan fired green teas provide the foundation for many of the bottled iced green teas on our grocer’s shelves. My exact point in talking about these flavor differences is for us to use the wide variety of green tea flavors to produce our own green tea blend. Sound difficult? Not at all. Have you ever put two different tea flavors into the same teapot? 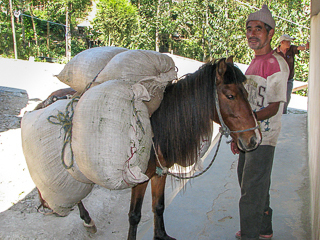 Transporting freshly harvested tea in Nepal. I can’t tell you how many times I have done this. I try to elevate the individual tea flavors to bring out a better blended flavor. What about putting Darjeeling green tea or Nepal green tea in with a pan-fired tea? The toasty, nutty foundation of the pan-fired tea will be softened by the more vegetal Nepal tea. 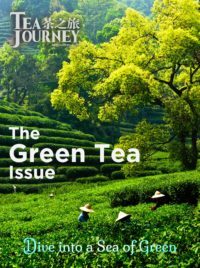 To use one-third Nepal green tea in the blend, I would use one teaspoon of Nepal tea and two teaspoons of Chinese pan-fired in the teapot. OK, taste. Almost there, but not quite your cup of tea; then try a 50:50 blend of each teas on your next brew. The wonderful world of tea blending is that there are no limits to the combinations in our tea universe. The Moroccans were early tea blenders when they added fresh mint to their pan-fired teas imported from China. One of my favorite green blends on the market today is a Chinese Mao Feng green tea blended with spearmint and lemon myrtle. When you start bringing spices and botanicals into your blends, the world becomes an endless journey. I will write more about these types of blends in the near future. Terraced tea gardens in Nepal. Simplicity is the key to my green tea blending. Let your teapot be the blending vessel with a notebook nearby to record your variations. Keep track of the date, blend, flavors and your thoughts. How would you change the blend the next time to elevate the desired flavor? More Nepal green tea or more Chinese pan-fired? And, eventually, violà!! You have the perfect blend to give you that smile with every sip. Now you sit back and enjoy the moment. Tomorrow will be another day and possibly another attempt at a new green tea blend. Good luck! In later articles, Tea Journey will explore just how far this crafting can go to produce truly outstanding and original blends. Join us as the journey continues.